Since I've come home from Camp (wow, how many years has it been since I've uttered those words??) I've been reflecting on the past happiness in my life. I've been blessed with a lot of it. But I've concluded that never before have I had eight straight days of pure, unadulterated joy. Dutifully trained by my mother, I brought Laurie a hostess gift. 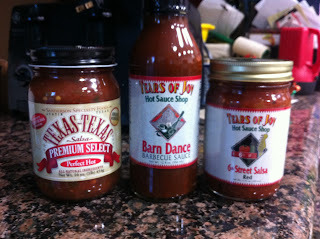 I brought Texas BBQ sauce, and Texas Salsa. Not being a BBQ connoisseur, I asked a friend who regularly enters BBQ cooking contests first if he sells his BBQ sauce (no) and secondly from whom I should order. He referred me to a company out of Austin. It's well known that Austin is the seat of all goodness... so not surprising. But the connection that Laurie made first, and then I later said it as though it was an original thought (my feet were barely on the ground all week) was that the Austin company name -- Tears of Joy -- was an apt description of my week. If you were around me at all, you know that I teared up when I saw my trailer, and cried outright each time a wall went up. And then after that, I cried every time the wind changed. But my tears were indeed tears of joy. The Monday morning after Camp I stopped at Wholefoods on the way to work. The cashier, Theresa, has been an acquaintance for years, and when she saw me her face lit up and she excitedly asked how my week was - that she had been thinking of me. I set my items down on the conveyor belt and burst into tears as I fumbled for my phone to show her photos. Someone recently asked me where I see myself 5 years from now. I answered that I can close my eyes and see what my day looks like, but I cannot see where I am geographically. It's true. In my mind's eye I can see my days unfold, and I feel how I will feel. But I do not know who will be around me or where I will be. And for now, I am okay with that: I know it is coming.